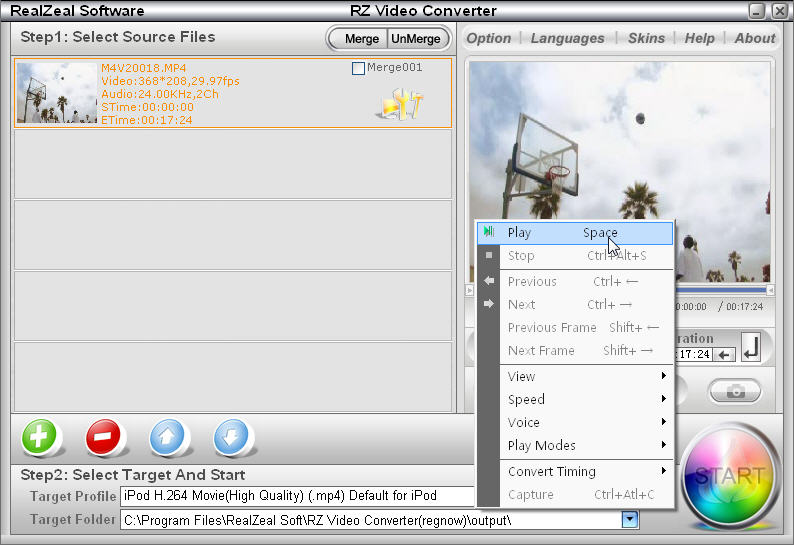 RZ MPG Converter can convert any video audio files (AVI MP4 FLV 3GP MPG Mpeg2), TS, M2TS, WMV, MKV, RM, RMVB, OGG(Theora,Vorbis), Wma, MP3, M4A, AAC, AC3 etc.) to MPG(MPEG-1,MPEG-2) or MP3(MPEG AUDIO).Built-in more video and audio edit tools, Video and audio joiners and splitters, Video and audio organizers, Video and audio Preview, etc. It is cool media file converter for MPG(MPEG-1,MPEG-2) or MP3(MPEG AUDIO). * Support all popular video files as source, including AVI, MP4(MPEG-4), H.264, H.263, Xvid, DivX, MPG(Mpeg-1, Mpeg-2), Mkv, WMV, MOV, RM, RMVB, 3GP, Flv(flash file, Youtube video file), ASF, TS, M2TS, NUT, RoQ, DSM, Evo, DVD/VOB, OGM, OGG, Theora, etc. * Convert any videos and audios to play on almost any Mobile Devices(Portable device) including iPod Video, iPod video nano, iPod classic, iPod touch, iPhone, PSP, Zune, ZEN, MP4 Player, video capable MP3 players, 3GP, Blackberry, video capable mobile phones, PDA, and Pocket P.C, etc. Support Sony PS, Xbox360, Apple TV, etc. Qweas is providing links to RZ MPG Converter 4.00 as a courtesy, and makes no representations regarding RZ MPG Converter or any other applications or any information related thereto. Any questions, complaints or claims regarding this application RZ MPG Converter 4.00 must be directed to the appropriate software vendor. You may click the publisher link of RZ MPG Converter on the top of this page to get more details about the vendor.